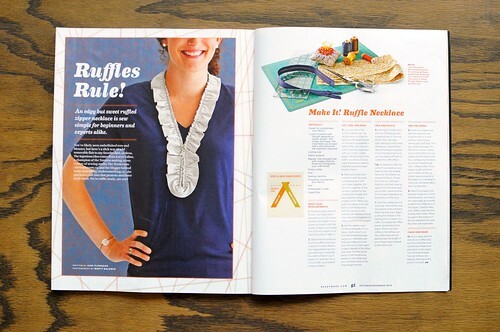 A few months ago, Jane Flanagan approached me to create a fashion DIY for a piece she was doing for ReadyMade Magazine. I jumped at the chance to be included in one of my favourite magazines and to work with the lovely Jane. Originally I had another idea for a necklace. Unfortunately when I sat down to make it, it looked nothing like the cute vision I had in my head. Drat! I remember looking desperately around my dining room/sewing area for a Plan B. I spotted a zipper and immediately thought that there must be something I could do with a zipper. I unzipped it and slipped it over my head like a necklace. Perfect. I knew if I added a cute ruffle, it would be a sweet accessory. I think this project is almost like a girlie version of a necktie. You can totally wear it with a simple tshirt or dress. Plus, it’s really easy and quick to sew. 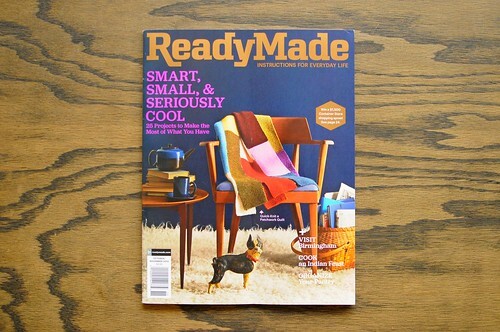 You can find the complete instructions in the October print issue of ReadyMade. One of my favourite parts of this project was getting to meet Jane in person! She met up with me one afternoon to watch me make one of the necklaces, so she could write out the instructions for the project. Thanks Jane, this was so much fun! I LOVE readymade! this is sooo amazing karyn! I like this girl necktie! This is such a cool and unique idea! Congratulations on your article, Karyn! This is a super sweet project. Congratulations Karyn! The project is adorable. I’m a huge fan of Jane Flanagan’s too. awesome, that looks really cool, and of course I love everything zipper! woah! how amazing to be included in this magazine! looks like a cute project and I like Jane’s writing. Karyn, that’s terrific! Congratulations, Readymade is amazing! Great project too, I’ll definitely have to make one up for myself! Totally adorable, Karyn. Can’t wait to see the magazine! Congrats Karyn!!! This is so great! I think I know what I’m making to wear at PIQF now!!!! Just got my copy!! Great piece Karyn! !